Viewscapes, what can be seen to and from the waters of the Rideau Canal, are one of the important values of the waterway. In this article I’m going to address two very significant aspects of the viewscape issue. I’ll start with an excellent initiative on the part of Parks Canada to restore some of the heritage viewscapes. I’ll follow that with a call to action regarding a deficiency on the Rideau, the protection of its general viewscapes. HERITAGE VIEWSCAPES I’m very pleased to see that Parks Canada has finally started to address a pet peeve of mine, heritage viewscapes. When I was writing “A History of the Rideau Lockstations” back in the late 1990s, I realized that I didn’t remember ever seeing the defensible lockmaster’s house at Upper Brewers lockstation, even though I had been to the lockstation several times. On my next trip I found it, hidden away by vegetation; you couldn’t see the lockmaster’s house from the lockstation and you couldn’t see the lockstation from the house. Parks Canada had allowed this building to become obscured by vegetation, completely removing it from its historical context. The same was true for several other defensible lockmaster’s houses such as those at Davis Lock and at Jones Falls. House with a ViewThe lockmaster's house on top of the knoll at Upper Brewers with a commanding view of the approaches to the lock. Cropped section from "No. 21 / Brewer's (Upper Mills) Locks" by John Burrows, c.1840s. Libraries and Archives Canada, 1979-12-21. Where's the Lockmaster's House?Can you spot the Locksmaster's House in this photo taken in October 2007 at the Upper Brewers Lockstation? Pay this lockstation a visit in 2008 and you'll clearly see it. When these lockmaster’s houses were built, they were placed on the height of land at the lockstation, which had been cleared of trees, providing an unobstructed view of both approaches to the lock. This was done for two reasons. One was for military defence – these buildings were built of stone, with gun slits, tin roofs and other defensive features. During the next rebellion or American invasion, one didn’t want the enemy to be able to sneak up on these fortifications. The other was the fact that these were the living and working quarters for the Lockmaster, who required a clear view of both approaches to the lock to see traffic coming. Unrestricted vegetation growth over the years has removed these building from their historical context. The heritage aspect of these buildings is not only the structures themselves, but their position on the landscape. We are fortunate on the Rideau, that, given proper heritage presentation, we can clearly understand today the role of these buildings. We don’t need 3D models or artist’s visualizations. Once the heritage viewscapes are restored, visitors to the site can see and understand for themselves the role of these buildings. It’s not only important for the Rideau, but also important from a Canadian history perspective; these buildings tell a tale of our early years, of tangible worries about rebellion, war and invasion. Parks Canada has now started to put some of these buildings back into the proper heritage landscape. Kudos go to Mary Ann Stienberg, Visitor Services Officer of the Rideau Canal Office of Parks Canada, for getting this project going. When I first approached Parks with this issue a few years ago, I got some sympathetic noises, but no action. I approached the issue again, a couple of years ago, as a potential Rideau Legacy project. Mary Ann fully recognized the heritage presentation rationale behind my request, but one of the difficulties at that time was that it had to be a Parks project since it was on Parks Canada land with all the various regulations and restrictions that entails. In the fall of 2007, Mary Ann was put in charge of several Katimavik students who were to be used for outdoor work, and with this group of eager labour, went to Superintendent Gavin Liddy for permission to move ahead with the heritage viewscapes project. Kudos to Gavin for recognizing the importance of the request and for giving Mary Ann the green light. Kudos too, to the local lockmasters, and to acting southern sector supervisor Anne-Marie Johnson, for fully assisting with the project, including assessing the potential viewscapes and determining exactly what should be done. Heritage Viewscapes for 2008 This project has already started at several of the southern Rideau lockstations, specifically Upper Brewers, Davis, Jones Falls and Newboro. Note that Parks Canada is not taking these places back to their original landscape (which was generally devoid of trees) – but rather opening up selected viewscapes so that visitors can see and understand the role of the building’s position on the landscape. As a bonus, these new viewscapes are going to vastly improve the visitor experience to these lockstations by providing many great photo opportunities to and from these buildings. In addition to the newly opened viewscapes, Parks Canada is putting policies and guidelines in place at these lockstations to maintain these viewscapes so that we don’t have to repeat this exercise in 25 years. There are more sites that should be assessed and cleared, but this is a very good start. Oh, and more kudos to Mary Ann Stienberg who is planning to add interpretive signage to these sites (yeah!! - I'm a big fan of interpretive signage). When the Rideau Canal was being evaluated as a World Heritage Site, there was an on-site evaluation done by ICOMOS (International Council on Monuments and Sites). The evaluation was primarily to make sure that what was stated in the nomination document was true, particularly with regards to management and regulations governing the proposed World Heritage Site and buffer zone. Parks Canada, as the custodian of the Rideau Canal World Heritage Site, has an obligation to fulfill the requirements of World Heritage Site designation. While ICOMOS found that the Rideau had excellent environmental protection, both in terms of management and regulations, it noted a deficiency in the protection of viewscapes. To quote from their evaluation document: “ICOMOS considers that the visual setting of the canal needs clearer identification and where appropriate tighter controls to protect identified vistas and the background to key features of the canal, which needs protection. The current arrangement which allows development only if it does not cause environmental damage could be strengthened to include constraints against development that might cause damage to the visual setting of the canal." To that end, the planner for the Eastern Ontario Field Unit of Parks Canada has been tasked with coming up with a solution. This is no small job. Firstly, what are appropriate visual settings along the canal? Your values regarding visual settings might be different than mine. And, once defined, how do you protect them? Given the 202 km length of the Rideau, and the various types of landscapes (urban, rural, recreational, natural) that it runs through, there are clearly going to have to be different solutions for various sections. What might be appropriate for Manotick probably won’t be appropriate for Opinicon Lake. Another problem is regulation. With the environment, values such as water quality can be quantified and measured. Regulations can (and have) been put in place based on these. Visual values aren’t quantitative, they can’t be directly measured. But, as evidenced in other jurisdictions, consensus agreement regarding what is appropriate and what is not can be arrived at. Once those are established, municipalities can enact regulations to protect these visual values. There are mechanisms to do this that have already been implemented in other municipalities in Ontario, we don’t have to re-invent the wheel here on the Rideau. It appears that Parks Canada plans to do a large scale study that will attempt to define the visual values of the Rideau Canal. This will involve extensive public consultation. We hope to learn more about this initiative in the next few months. To read the ICOMOS report in full, head over to: whc.unesco.org/en/list/1221/, go into the documents section and download the document titled “Advisory Body Recommendation” (a 4 Mb PDF file). It makes for an interesting read. What impact will the designation have on the Rideau itself as a much used and much loved historical waterway? What are the ramifications for people and for the cities, towns, and communities through which it passes? These questions were very much to the fore in the Rideau Waterway Symposium, held in Kingston in November 2007. Mayor Lawrence Mahinney of Lunenburg, Nova Scotia, commented on his community’s experience since it had been designated a World Heritage Site in 1995. With a population of 2,500 people experiencing constant decline, the WHO designation prompted significant changes: increased number of visitors; increased proportion of out-of-country visitors; longer visitor stays and increased spending; a 10% p.a. increase in property values. Underlying Mayor Mawhinney’s presentation was recognition of the need to critically examine the economic benefits of increased tourism. While recognizing the benefits of increased spending, the diversification of the economy, and the participation in a world market, these were accompanied by questions about impacts on social cohesion and identity, along with pressures on natural, cultural and historical heritage and the need to focus on the sustainability of tourism. Brian Osborne, Queen’s University, led the discussion of the need to protect the “unique heritage” of the Rideau Corridor consisting of its “diversity of settlements, buildings, and landscapes” and its “canal and military engineering features.” Again, the crucial question was: how can we safeguard this rich natural, material, and intangible legacy “for current and future generations” and ensure its continuity as a “sustainable, authentic, respectful, and enjoyable” element of our life? Gavin Liddy, Superintendent of the Rideau Canal, left his post in early December to take on a one-year assignment as Associate Chief Administrative Officer of Parks Canada. In this new role, Gavin will supervise the day-to-day finance, information technology, real property, human resources operations and informal conflict management operations of the Strategy and Plans Directorate. In addition, he will be a member of Executive Board and chair the Finance Committee. Replacing Gavin is Gordon Giffin who has been appointed the Acting Field Unit Superintendent effective 9 December 2007. Gord brings over 33 years of Parks Canada experience to his new duties including working the past six years as a member of the Eastern Ontario Field Unit Team as Superintendent of St. Lawrence Islands National Park. Our faithful scribe, Brian Osborne, is taking a break after writing 25 superb Byways articles for this newsletter. On behalf of Friends of the Rideau, I’d like to thank Brian for this wonderful series. The first Byways was published in the Winter/Spring 1999 edition of this newsletter. Brian's articles have provided interesting insights into many different aspects of the Rideau Waterway. Brian is contemplating putting these together into a book - so we may yet get to enjoy Byways again. This is a cryptic notation used by Jones Falls’ Lockmaster Peter Sweeney in his diary in reference to his wife Catherine. It stands for “Catherine Drunk, Had A Quarrel” and it is repeated numerous times throughout the diary which covers a 12 year span from 1839 to 1850. The Sweeney home life was clearly quite tumultuous. Friends of the Rideau is presently working to produce this diary as a book, hopefully to be available this coming summer. A dedicated group of volunteers has come together under FoR Publication Chair, Ken Watson. We have the invaluable help of Sue Warren, local historian and researcher. Sue did the original transcription of the Sweeney Diary on a contract with Parks Canada about 20 years ago. At that time, not only did she transcribe the diary, but she compiled an extensive “Who's Who” of people mentioned in the diary. She also did a great deal of research on Peter Sweeney, some of which she incorporated into her book, “Hub of the Rideau - A History of South Crosby Township” (1997). Ken approached Sue a couple of years ago with an offer – “How would you like to become part of Friend’s Sweeney Diary Project? We can offer you the same pay rate the rest of us are getting; a good feeling that we are helping to bring to light another aspect of the fascinating story of the Rideau.” How could Sue refuse? The project couldn’t launch until funding was available for the printing of the book, and this happened last fall when FoR created the Rideau Legacy Fund, placing a large donation, and all profits from the sale of Rideau 175 merchandise, into the fund. The Sweeney project was then officially launched. FoR directors Rowena Cooper and Ed Bebee both jumped on board and the details of the project were fully scoped out. We’ve been busy these last couple of months. Ken OCR’ed (Optical Character Recognition – converting typewritten text to digital text) the entire diary transcription. Mary Ann Stienberg of Parks Canada graciously offered to help, providing secretarial and Katimavik student time to do the required proofing of the raw OCR’ed text. Rowena has been burning the midnight oil at the National Archives going through the original diary. Sue did her transcription using a photocopy of the diary and some words were impossible to interpret. Rowena has been working to solve these puzzles. Ed has been going through papers at the National Archives looking for any additional information about Peter Sweeney. Ken has been searching out illustrative material for the book. Both Rowena and Sue have been doing genealogical research on Sweeney. The project is progressing well. Sue has completed a revamp of her “Who’s Who,” and is presently working on a “Life and Times of Peter Sweeney” piece to put Sweeney and the diary into historical context. Rowena has almost completed her review of the original diary and will put in a request to the National Archives for some page scans of the diary for use in the book. Once all of this is done, Ken will take the whole kit and caboodle, put on his editor’s hat, and wrestles all the material into a print-ready document. Then, after the team has had the “joy” of proofing that document (several times), it will be ready for the printer. The next conference of the Rideau Heritage Network is scheduled for Wednesday, March 19, 2008, at the South Elmsley Municipal Hall. This gathering will provide an opportunity to discuss the values of the Rideau Canal as a World Heritage Site and how it should be preserved for future generations to enjoy and appreciate. A small registration fee will be required at the door to cover the cost of the hall and lunch. An agenda will be finalized shortly. To register, please contact Susan Millar at susan.millar@pc.gc.ca. Some of these are factual tales, some not so much. For the latter, I’ve tried to source the factual basis, if any, for the tale. There are several ghost tales, a couple of murders and a few factual stories such as why the dam at Hogs Back failed three times during its construction. Head over to www.rideau-info.com/canal/tales/ and have a look. The following story is one of my favourites, taken directly from “A History of Leeds and Grenville” by Thadius Leavitt, published in 1879. It’s a short tale, told by Thomas McCrea, an early pioneer in Montague Township. The story takes place in about 1797. When I first read this poignant story, it struck me as a fascinating example of the extreme privations experienced by the early settlers. These men and women spent all their time just trying to survive, to build a new life for themselves and their children in the Canadian wilderness. Although they were living in extremely rough conditions, it didn't mean that they didn't pine for a few luxuries, in this case, fine china bowls. “The whole of the inhabitants, for miles around, had gathered to raise a log house; at that time it took three or four days to complete the undertaking, men being very scarce. On the third day, after the last log had been placed in position, a council was held, and, after due deliberation and much discussion, it was decided that the settlement had so far advanced in civilization that some of the luxuries of life should be procured. Our grist mill consisted of the primitive stump and pestle, the meal when ground being eaten from wooden bowls with wooden spoons. It was decided by the council that I should take one and a-half bushels of wheat, carry it from the site of Merrickville to Brockville, exchange it for one dozen bowls, one dozen iron spoons, the balance to be expended in groceries. With the bag on my back I started for Brockville, before the sun was up, the road consisting of a winding path through the woods, with marks on the trees to show the direction. During my journey I was buoyed with the thought of the great surprise which was in store for our good wives, as the matter had been kept a profound secret from them. Never did a minister go out to preach the gospel feeling a greater responsibility than I felt resting upon myself. I arrived at Brockville on the evening of the second day, pretty tired, and the next day I exchanged my wheat for a dozen white bowls with a blue edge and one dozen iron spoons bright as silver, half a pound of cheap tea and the balance in fine combs and little things for the children. Early next morning, with a light heart, and carefully guarding my precious load, I started for home. I arrived at North Augusta in the evening, and when crossing the stream at that place, on a log, the bark gave away and down I fell, some ten feet on the stones below, and horror of horrors, broke every one of my bowls. Never, never in all my life, did I experience such a feeling of utter desolation. How to go home and meet the expectant people, without the bowls, was an ordeal my soul shrank from, but there was no help for it. (quoted from "A History of Leeds & Grenville" by Thad. Leavitt, 1879, p.76). Friends of the Rideau member, Rideau Canal Boat Tours, has converted their tour boat’s diesel engine to an environmentally friendly electric engine. “Chuckles” is a 1940 cruiser that was restored by Lance Jervis-Read, a shipwright. Better known as “Captain Lance,” for the last few years he has been taking people on boat tours aboard Chuckles, cruising between Chaffeys Lock and Jones Falls. Lance is following in the pioneering footsteps of FoR director Dave Brett, who first launched his electric cruise boat, the “Harriet By” in Merrickville, back in 2000. Converting a vintage cruiser to electric is no small task. Lance has spent most of the winter searching out the best electric solution for his boat. He’s found an electric motor/battery combination that will provide the same performance as his old diesel engine. He’s now busy doing the conversion work. It will be worth taking a tour with Lance next summer just to experience the quiet ride and to find out how he managed to do the conversion. A new year seems an appropriate time to move this fishing-related column in a new direction. My current interest is in identifying those unsung individuals who made and make the Rideau Canal work – the canal staff – and the challenges – internal & external – they faced. In the course of events, I’ve come across people that also appear in my fishing books, Pathfinders and Fish Tales. The Department of Marine and Fisheries regulated fishing on the Rideau. In 1880 Superintending Engineer A. T. Phillips instructed all lockmasters that they were expected to assist the Overseers and to prevent illegal fishing around their stations to the extent possible. Brazenly, Bank Street Bridgeman John Little fished illegally, encouraged others to do so, and opposed enforcement by the Fishery Overseer, according to an indignant letter to Little from Phillips. In 1887, Phillips threatened Arthur Jones, Smiths Falls Detached, with suspension over reports that he had been manipulating the locks and using lights to spear fish. Incidentally, there is a painting of Arthur Jones adorning the entrance to the Lockmaster’s House in Smiths Falls – a fishing scene, of course. During the heyday of guiding on the Rideau, the guides and their boats provided a lot of traffic to keep the lockmen busy, day and night. In the early 1920s, “Iron Ed” Curry of Westport was renowned for rowing into Newboro early in the morning and waking up Herman Warren, then lockman, who was living in a tent at the locks to be available 24/7. Some guides sought the job opportunities provided by the locks in the slow times of winter and the Depression. Bill Mason, one of the earliest guides at Jones Falls, had been a temporary worker in 1871. Spence Baxter, another guide from Jones Falls, had actually signed on in September 1929 as cook on the Carpenters’ Boarding Scow. The records note laconically that he “abandoned” the permanent position in August 1930. Spence clearly remembered this experience, since his name appears as “Cook” and also as “Extra Labourer” on a February 1936 list of men recommended by C.D. Howe, Minister of Transport, for casual employment in Leeds. Bill Flynn, Jones Falls, and Henry White, Chaffey’s, were also on this list as “Extra Labourers”. Guides must have had real political clout! Lockmaster Herman Warren of Chaffey’s had a serious row with lockman Jack Patterson in July 1933. The County Constable from Delta had to remove Patterson from the lock premises, and Patterson was subsequently dismissed. His temporary replacement was a guide from Jones Falls, Ormand C. Baxter. J.W. Simmons, Chaffey’s Lock, who was the representative of the Hon. H. A. Stewart, MP for Leeds County, politically recommended him. Messrs. J.S. Dargavel, Elgin, and T.E. Foster, Smiths Falls also supported the recommendation. There are/were a number of Canal staff members with family links to other guides, but we’ll leave all that to another time. Happy ice fishing! 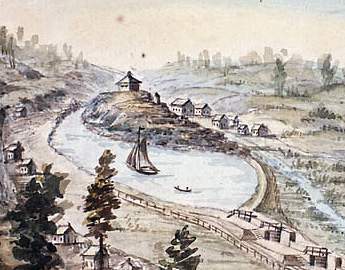 Largely unrecognized, one of the most valuable contributions of the Rideau waterway to the longer term development of inland British North America was its role in immigration, which spanned the 1830s and 1840s. As Helen Cowan wrote in her monumental study 80 years ago, never before had anything as representative of British society left her shores, and in such numbers. It was the age of the Great Migration, and coincidentally the Rideau route was available just at the right time. Although some immigrants chose to settle in Bytown and along the route to Kingston, the majority of our ancestors journeyed on to the western parts of the province. There, they counterbalanced the dominantly ‘American’ population, which had moved into Upper Canada before the War of 1812. By mid century, Canada was never so British. Before the completion of the Rideau, the immigrant passage along the upper St. Lawrence, requiring at least four portages, was “tedious and irksome”. The roads were generally “the most wretched imaginable” and the jolting “nearly insufferable”. Immigrant officials despaired that the misery and associated costs would stem the flow inland or divert settlement to the United States. Traveler’s accounts published back home advised that, “for emigrants with large families and cumbersome luggage, destined for the upper province…the Rideau Canal is their only proper route”. For a while in the earlier 1830s, the two routes competed in this business, but by 1840 the immigration pattern had become clear: 12,000 had passed through Bytown, while only 350 had landed in Kingston from the St. Lawrence. The immigrant sheds at Cornwall and Prescott fell into disuse. During these years - when coincidentally the Rideau had become established as the linchpin in a thriving trans-Atlantic trading system - double the shipping capacity had to be supplied to Kingston for transshipment of bulk commodities such as grain and potash for export. Fortuitous timing. For with the influx of immigrants reaching its climax by the mid 1840’s, those otherwise half-empty, westward-bound barges became populated with the folk who were to settle inland. They filled up the ‘backwoods’ of Ontario by 1850, and made the union of Canada possible within a generation. In 1843, one of the peak years, of the more than 44,000 immigrants that landed in the Maritimes and Quebec, 30,000 moved to Upper Canada via the Rideau. To put this in perspective, more than ten times the population of Bytown passed through that community in a single navigation season! While it is true that in the earlier days conditions on some of the open, overcrowded barges caused discontent, the chief immigrant agent could report by 1844 that, “the facility and comfort” of the voyage to Great Lakes ports had become “rather an excursion of pleasure, than a serious undertaking”. The cost, moreover, was dropping, owing to competition among the forwarding companies. In fact the charge for the leg from Bytown to Kingston was less than one-third of that from Kingston to Toronto in 1842. At the same time the cost of transportation by land was almost prohibitive, about four times greater. Nor was the price factor academic. British immigrants might have been attracted south of the border by the cheaper Champlain route. Thus did the Rideau play a pivotal part in populating Upper Canada during one of the most important decades before Confederation. Even as railroads were to build the country westward in the generations after Confederation, so had the locks and dams of Col. By’s great work, in this earlier period. Naturally, the Rideau abruptly lost its dominance in this trade with the completion of the St. Lawrence canals in 1847. By that time, however, the high-water mark of immigration was past. Serendipitously, the Rideau had performed a most valuable service in the settlement of Ontario, unheralded to this day. Somewhere in the mind’s eye, one can still see the starched, British military silhouette of its builder rising again to salute his masterwork that, in this role too, when called upon, had done its duty. The Rideau Canal World Heritage Site is made up of six elements, the Rideau Canal (lockstations and waterway), and the fortification sites in Kingston which consist of Fort Henry, Fort Frederick, Cathcart Tower, Shoal Tower, and Murney Tower. 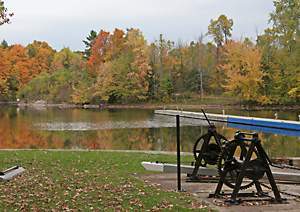 The boundaries of the Rideau Canal consist of the high water mark of the slackwater canal sections and the Parks Canada Agency’s property at the twenty four lockstations. The boundaries of the Kingston fortifications are defined by Parks Canada Agency and Department of National Defence property. The buffer zone is a 30 metre wide zone adjacent to the boundaries of the site.